They beheld You who are peace beyond comprehension O Word. The Holy Martyrs Sophia and Irene were from Egypt and were beheaded for confessing Christ during the reign of Emperor Aurelian (270-275), when Claudius was governor in Egypt. 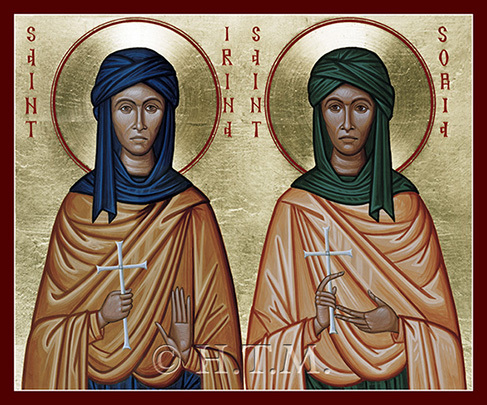 They are commemorated the day after the Holy Martyr Sophia and her daughters Faith, Hope and Love. 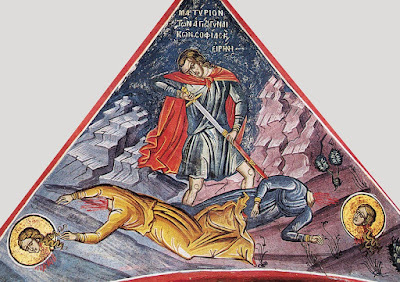 There is an Athonite fresco with a scene of their martyrdom from 1547 at Dionysiou Monastery. One tradition says that after being beheaded, a Christian picked up their relics and deposited them in her house, where many miracles were performed. Emperor Constantine was informed of it, and had the relics of Saint Irene transferred to Constantinople and built a large church in her honor. The Bollandists, in their commentary on the Roman Martyrology, pointed out that, in Constantinople, in the Church of Hagia Sophia, there existed, as one of its dependencies, the Church of Saint Irene.